`Escape: Illusions` includes two new modules for the Escape base game that can be used individually or mixed with any other available modules. The 'Illusion Chambers' module consists of six chamber tiles that replace the tiles with only one magic gem in the basic game. After players return to the starting chamber during the game – something they must do twice in order to avoid losing a die – all illusion chambers in play are removed and returned to the bottom of the tile deck. Hopefully you already completed your business in any section of the temple now disconnected from the rest! 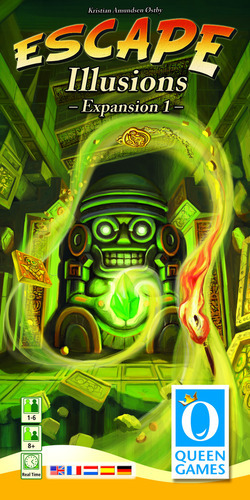 Nota: Requiere juego básico `Escape: The curse of the temple` para poder jugar. Nos gustaría tener aquí tu opinión. Opina y guarda "Escape: Illusions."